The numbers are shocking. Just two out of 10 American adults meet recommended levels of physical activity. Nearly three out of 10 Americans ages 6 and older admit they aren’t active at all, despite reams of research proving that exercise is a powerful preventive, and sometimes an antidote, for disability and illness. 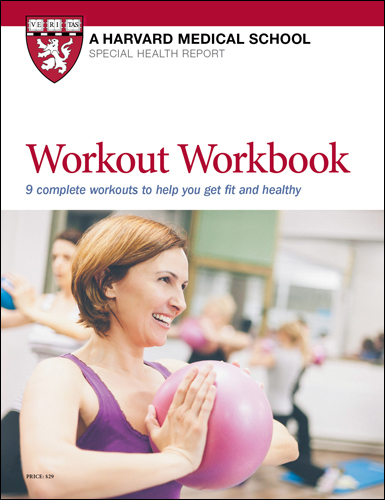 This Special Health Report, Workout Workbook: 9 complete workouts to help you get fit and healthy, features nine excellent workouts that will challenge your body and spirit in a variety of ways while warding off boredom. Even the best equipment and most tricked-out gyms only produce results when used regularly. Learn to use equipment properly to avoid injuries that could sideline you temporarily or permanently. Exercise equipment comes in all sizes, shapes, and price ranges. It pays to check consumer ratings and follow our other tips for smart consumers before making your purchase. Following are some basics you should know if you're in the market. If you stop by any gym, you'll see rows of machines designed to simulate cycling, walking and running, kayaking, rowing, skiing, and stair climbing. Whether motorized or not, sized for heavy-duty gym use or in lighter home versions, these machines offer good cardio workouts that burn calories and fat. What's more, your workout takes place indoors, away from fickle weather. Price varies from a few hundred dollars to thousands, depending upon whether a machine is motorized or programmable, and whether it has add-ons, such as devices to measure heart rate, calories or METs burned, time elapsed, and so forth. While this information tends not to be entirely accurate, it could encourage you to step up your workouts or may be important if your doctor has advised you to limit activity. The following are some of the more popular types of aerobic exercise equipment. This machine lets you exercise arms and legs simultaneously, as you would in cross-country skiing. The sliding motion is easy on the knees. On some machines, you have to move one ski forward to make the other move back. On others, the skis move independently. In addition, certain ski machines use ropes, while others have stationary handgrips. Check out all these types to see which one is most comfortable for you. Look for a wide foot bed for stability. These machines provide a circular up-and-down motion that's a cross between a ski machine and a stair-stepper. They provide a nearly impact-free workout, which is easy on the joints. Resistance and grade can be adjusted automatically or manually on some models, and levers with handgrips to work the upper body may be available, too. It may take a little while to get used to the unusual motion. Look for comfortable handlebars and nonslip pedals with curved ridges. Try the machine out at varying speeds and grades to make sure it feels stable. Rowing machines work the back, arms, and legs simultaneously, offering as close to a total-body workout as available from a machine. Unless you're used to rowing, the motion initially may feel unfamiliar, and some people find it hard on the back. When purchasing one, consider pulley models instead of piston models for a more realistic rowing experience. These machines provide a low-impact workout that approximates climbing flights of stairs. Some modes have levers with handgrips to work arms, too. Beginners may find stepper machines strenuous, and the motion can be hard on the knees. Look for machines that provide independent foot action and are equipped with handrails and large stair platforms. An exercise bike takes no training and is easy to use, although it can be uncomfortable for long stints. While riding isn't as effective in preventing osteoporosis as weight-bearing exercise, it does provide an excellent cardiovascular workout. Look for a model with a comfortable, adjustable seat and toe clips. If the seat is too hard, find out if you can replace the seat with a cushioned model bought separately. This machine enables you to walk or run indoors. Some models offer a flexible, less joint-jarring surface. Opt for a motorized treadmill. When purchasing one, look for a strong motor (the machine will last longer), a belt that's long and wide enough for your stride, a sturdy frame with front side rails for safety, and an emergency stop device. You should be able to adjust the speed and grade so you can walk at a comfortable pace. By harnessing gravity, body weight, external weight, or tension as a resistance force, these devices help you build strength. As with cardio equipment, styles and prices range widely, from expensive professional equipment most often found in gyms and health clubs to affordable, portable home models. If you're just starting out, you can save a fortune by selecting a few basics — comfortable walking shoes plus hand weights or resistance bands or tubing — instead of investing a considerable sum of money in weight lifting machines. These are optional for strength exercises like the side leg raise and hip extension. Look for comfortably padded ankle cuffs with pockets designed to hold half-pound or 1-pound weight bars to add as you progress. Ankle weight sets are usually 5 to 10 pounds. A single cuff may suffice, depending on the exercises you intend to do. Choose a nonslip, well-padded mat for floor exercises. A thick carpet or towels will do in a pinch. Depending on your current strength, start with sets of weights as low as 2 pounds and 5 pounds, or 5 pounds and 8 pounds. Add heavier weights as needed. Dumbbells with padded center bars and D-shaped weights are easy to hold. Weighted bands that strap onto wrists and kits that let you screw weights onto a central bar are available, too. Weights are a good place to save cash by checking sports resale stores. Resistance bands or tubing can be used for a full-body strength workout. Attractive features include low cost, light weight, portability, and ease of storage. As with weights, you can measure how challenging the resistance is by how many repetitions of an exercise you can do: if less than eight, resistance is too high; if more than 12, it is too low. Positioning your hands or feet closer together or farther apart on the band or tube before starting an exercise helps vary resistance. Try different positions to learn which make repetitions easier or harder. Bands. These look like big, wide rubber bands. They come in several levels of resistance from very light to very heavy, designated by color. Tubing. Look for tubing with padded handles on each end. These also come in several levels of resistance from very light to very heavy, designated by color. Some brands come with a door attachment helpful for anchoring tubing in place when doing certain strength exercises. Can medications make the heart stronger, like exercise does? Q. When a friend of mine had a stress test, his doctor gave him a medication to make his heart work harder, instead of having him run on a treadmill. 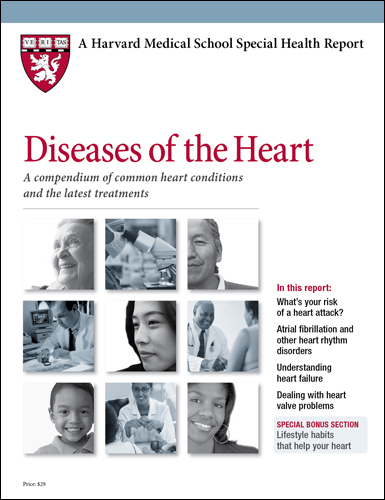 Does that mean medications could replace exercise to strengthen the heart? A. When a person can't or shouldn't exercise, doctors use medications instead of a treadmill to conduct a stress test. Some of these medicines (such as dobutamine) make heart muscles work harder; others (such as adenosine) widen the coronary arteries. These are one-time alternatives to exercise that, given their side effects, must be administered with care. Exercise conditions your blood vessels to increase blood flow to the heart and other muscles when they are working harder. It improves the lungs' ability to oxygenate blood. And it strengthens muscles and makes them work more efficiently. A pill that replaces exercise would make life easy. But I doubt that anyone will ever find one that delivers the widespread benefits of exercise on the body and mind as safely and effectively as a brisk daily walk.